This is a fast-paced action/chase/adventure written with plenty of of boy appeal. There's a bit of mystery as Benjamin Bloomswell is left with his uncle while his parents are on a business trip. Soon, he's shocked to discover that his parents are being reported dead in the newspapers. As he makes his escape from an orphanage in order to reunite with his sister, he's forced to stowaway on a ship headed from New York to Europe. The story didn't feel as steampunkish as I expected. Except for the rarely seen mechanical clockwork men there aren't very many sci-fi'ish touches. Benjamin hides inside one when he's smuggling himself across international borders. This is a solidly middle-grade level read - there's not even a hint of romance, and the main part of the story focuses on the mystery of what's happened to Benjamin's parents. There's an almost dreamlike sense behind the chase scenes, as Benjamin escapes from one pursuer, only to have to stay one step ahead of another generic bad guy. While this is an American-published book, it has the feeling of having been translated - it feels just a touch alien, which is not at all a bad thing. 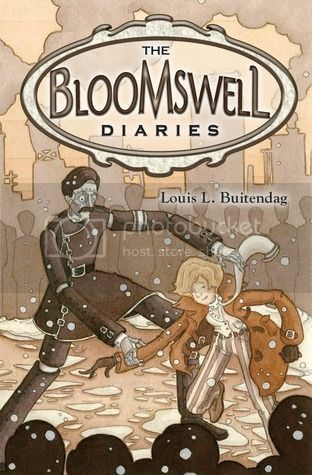 Fans of Lemony Snicket's Series of Unfortunate Events, or The Incorrigible Children of Aston Place by Maryrose Wood, who are looking for more stories of plucky, determined orphans fighting against conspiracies and impossible odds will enjoy The Bloomswell Diaries.